I’m continuing my “Under the El” series, which recently visited 31st Street in Astoria, with a walk under Manhattan’s last remaining el, which continues on as far as Van Cortlandt Park in the Bronx. It is a northern extension of the 7th Avenue IRT and runs above three separate streets — but spends most of its time above Broadway, which is one of the longest routes in New York City and also New York State. Time was, you couldn’t swing a dead cat without hitting an elevated train in Manhattan. There were four trunk lines, the 2nd, 3rd, 6th, and 9th Avenue Lines that originated, in the case of the 9th Avenue, as early as 1868. However, those weren’t the only four streets darkened by els. 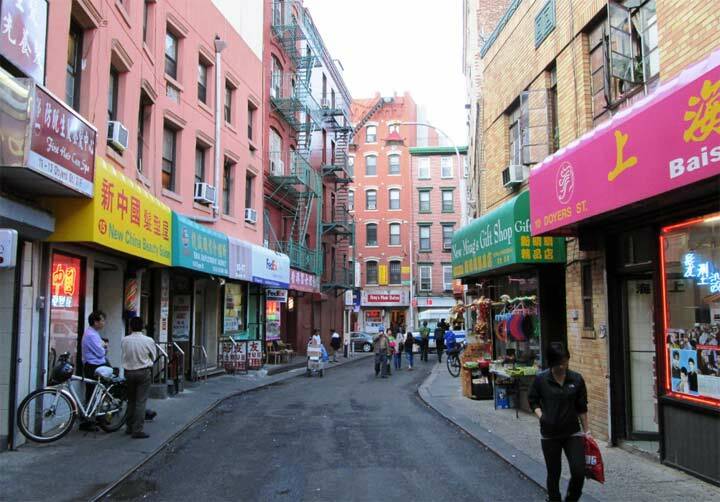 Below 14th Street, els ran on Pearl, Greenwich, Allen, Division Streets and the Bowery, and above 110th Street, the 9th Avenue El switched to 8th Avenue, and below 23rd Street, the 2nd Avenue El ran above 1st Avenue. There were two major points of exchange between the lines at South Ferry and Chatham Square. Did you know 42nd Street had an el? It was a spur line that ran to Grand Central Terminal from the 3rd Avenue El. Other such “spurs” connected the 3rd Avenue El to the then-existing 34th Street Ferry across the East River and also connected the 2nd/3rd Avenue Els to City Hall. And, while the 6th Avenue El ran west on West 53rd to meet the 9th Avenue, a spur track ran up 6th Avenue to the 58th Street station. A spur of the 2nd Avenue El ran across the Queensboro Bridge to Queensboro Plaza. The Brooklyn Bridge connected Manhattan and Brooklyn el lines, as well. Beginning in the 1930s, Manhattan’s els vanished, owing to greater subway construction (The IND was built between 1925 and 1950), bus routes, and real estate developers who wanted more sky views. The last “pure” el, not connecting to a subway, ran up 3rd Avenue in Manhattan up to 1955 and wasn’t eliminated in the Bronx until 1973. But that wasn’t the end of elevated trains in Manhattan. Several stations on the IRT line are in the Original 28 subway stations opened on October 27, 1904, between 50th Street and 145th Street. But IRT engineers weren’t finished and were not stopping at 145th. The 19-aughts — and on into the 1930s — were an era of feverish, concentrated subway building that puts to shame the over 40 years it has taken between first shovels for the Second Avenue Subway and its expected imminent opening in December 2016. The IRT expanded up Broadway, reaching Inwood in March 1906 and Riverdale by August 1908. North of Dyckman Street, because of Manhattan’s topography reaching an uptown valley, the line was placed on an elevated structure (as it had been for the 125th Street station in Manhattan Valley in 1904). This elevated line has survived and thrived and will likely run as long as there is a NYC subway system. Because Forgotten NY does not subsist by el alone, I wandered west a block to Kingsbridge Avenue and West 236th Street, whose southeast corner is dominated by the latest 50th NYPD Precinct House, which looks like it was put together by a committee. I much prefer the old 50th Precinct building a short distance away at Kingsbridge Terrace and Summit Place, a Beaux Arts brick masterpiece executed in 1902. The opposite corner of Kingsbridge and West 236th used to be known as Lou Auger Square. In his monumental History in Asphalt, the Origin of Bronx Street and Place Names, the late historian John McNamara explains that Auger was a volunteer with the local Little League and the precinct for thirty years; Auger was recognized here in 1988, two years after his death. Unfortunately the sign had disappeared during my 2016 walk. Later editions of the hand-drawn Hagstrom maps (eliminated by new CAD versions around 2000) didn’t help, since they labeled it “Lou Anger Square”! The wonderfully crenellated chalet-type elevated station at Broadway and West 238th Street. But in the foreground is something I found even more interesting. Here we have a DUGONG (OBGUN-69a) style street vent, fashioned to allow the dispersal of miasmic underground vapors. But this is the only instance of a Dugong being used to mount a stop sign. Oddly enough I have never eaten in the Riverdale Diner at Kingsbridge Avenue and West 238th. I have, however, been in the Tibbett Diner on nearby Tibbett Avenues, whose fortunes have fallen and risen in recent years. Though the Riverdale Press says the NW Bronx is “diner heaven” the Riverdale Diner is nowhere to be found in the copy! That may be because technically, it’s in Kingsbridge. As stated in Part 1, I found the Broadway el fertile ground for infrastructural oddities, such as this former Metropolitan Transit Authority station indicator. From 1968-2000 or so the logo was a two-toned blue capital M; it’s since been replaced by the “Doppler” MTA bullet that appears on train cars but is not, to my knowledge, used on subway entrance lanterns. The red color means this is only an exit. Light Emitting Diode lamps had yet to dominate Broadway in 2016, but a couple of Twins, with both straight masts and mini cobra necks, have been installed at West 238th. Post-top lamps of this type dominate Broadway from West 230th north to Van Cortlandt Park at West 242nd. However, south of West 238th, all had their “post top” lamps removed and were given mini-cobra necks. But, between West 238th and West 242nd, they’ve been permitted to keep their post top lamps. The 4-paned “cottage” style lamp is one of the originals from when they were first installed in the 1970s. There are a number of long-disused pendant lamps on the underside of the Broadway el at West 240th Street. A pair are Westinghouse AK-10 cuplights installed in the 1940s or 50s that are missing their glass diffuser bowls; others are their predecessors, the flat-brimmed 3438-1 (as numbered in my well-thumbed copy of the Handbook of New York City Street and Park Lighting Equipment, issued by the Welsbach Corporation in 1963). One always needs a copy when skulking around with a camera, looking for light fixtures. I doubt these lamps have worked for close to fifty years, though some still have their incandescent lightbulbs still in place! Manhattan College, which owns Gaelic Park on West 240th just west of Broadway, keeps close wraps on views, since there’s an admission fee for most events here, but I was able to sneak in for a couple of photos. Named in honor of Riverdale’s large Irish-American population, it has been home to soccer, softball and hurling for decades; my father attended matches here. It has been home to Manhattan College Jaspers soccer team since 1991, when the school purchased the grounds. There is a dance hall and cultural venue as well. In the 1970s Gaelic Park was a lively rock venue; the Grateful Dead, The Allman Brothers and Deep Purple have all appeared here. Behind the field we see some traincars laid up in the 240th, or Van Cortlandt, NYC subway yard. The yard is celebrating its 110th anniversary along with the Broadway el, as operations began in 1906. Acre for acre, the Bronx has more parkland than any other borough, much of it in the huge 1150-acre Van Cortlandt Park, whose southwest entrance is at Broadway and West 240th Street; the 2770-acre Pelham Bay Park; and the 725-acre Bronx Park. The Parks Department installed a statue of a coyote here in 1998: coyotes have gradually assumed the ecosystem slot that was deserted by the departed timber wolf in upstate New York over the years, and a number of the canines have been spotted in the northern Bronx since the early to mid 1990s. In 1995, a coyote was found on the Major Deegan Expressway, the first such animal seen within city limits in nearly 50 years. The city may no longer be inclined to erect statues of the beasts in 2016, as they have become so common as to be considered pests. In November 2016, a pack of coyotes was captured and euthanized near LaGuardia Airport. The vast Van Cortlandt Park complex is deserving of its own website, much less a mention on a website. The 80-year-old Van Cortlandt Stadium, on the east side of Broadway north of Van Cortlandt Park South, was constructed as part of the Works Progress Administration founded during the Depression, and bearks the hallmarks of Moderne streamlined design on the concrete stands. The stadium opened September 22, 1939. A long-ago art project by local students is still in place in the stadium. The two northernmost stations of the IRT 7th Avenue Line or, as I’ve been calling it here, the Broadway El serving the #1 train, West 238th and West 242nd Street, opened August 1st, 1908. Esthetically, the station is interesting, as the platform canopies are supported by wood columns, there are wood planks on the floor of the station house on the northern end, and there’s a venerable pedestrian walkway to the east side of Broadway to VCP. For me, the most intriguing aspect of the station is the back end of the platform on the east side of Broadway, which not only has original railings (see Dyckman Street in Part 1) but also original station lamps in original condition for the most part; some of the reflector discs are still in place and some of the incandescent bulbs still work! Here’s a view from the 1950s of what the platforms originally looked like, with these lamp stanchions and wood planked walkways. Manhattan College moved to the Spuyten Duyvil area in 1922 (from Manhattanville), but it took another 31 years to rename Spuyten Duyvil Parkway for Manhattan College. It takes a serpentine route up a steep hill to the Henry Hudson Parkway. The high rise in the background is a dormitory for Manhattan College students. Interestingly the immediate area surrounding the MCP/Broadway junction used to be called Warnerville. There had been a large mansion owned by the Warner family standing where Gaelic Park is now. I’ve visited the Van Cortlandt Mansion, a short distance inside the park from Broadway, before, but perhaps you haven’t seen these particular angles of the place before — I tried to get some new ones. This Georgian-style country house made in the fieldstone style was built in 1748 for Frederick Van Cortlandt. The vast athletic field north of the mansion was at one time the Van Cortlandt farm, and had large planting fields, livestock, and a grist mill. George Washington used Van Cortlandt Mansion as a headquarters during the Revolution. The house is maintained by the National Society of Colonial Dames as a museum appointed with period Colonial and Federal collections. I really loved the design and type font on this bronze plaque on the back entrance of the VCPM. The Latin phrase on the bottom, “Virtutes Majorum Filiae Conservant”: “Daughters Conserve the Virtues of Their Elders” is the motto of the Colonial Dames, “founded in 1891 by a group of Philadelphia women, dedicated to Colonial History historic preservation and patriotism.” Of course the plaque uses the V of Importance. And look at the way they slanted the lft ascender on the N’s! Nobody does that anymore. Who is that guy? It’s General Josiah Porter (1830-1894). General Porter was the first Harvard College graduate to enlist in the Union army during the Civil War. As a captain he commanded the 22nd Regiment of the NY State National Guard in the war. He rose to adjutant general in 1886. The bronze likeness was executed by sculptor William Clark Noble in 1902. Since I’m thorough, I’ll show all 4 sides of the base, since they are all inscribed with information. One thing that has always characterized Van Cortlandt Park for me is its vast stretches of what was originally a parade ground. I remember a few years ago, well, maybe more than a few, when I took the #1 all the way to 242nd for the first time, went down the steps to Broadway, entered the park and saw this huge field in front of me. It was in the fall: there was a football team over here, a cricket “test” over there, and a team of runners on the track. I have never been an athlete but at that moment, I almost wished I were; the energy was palpable. Long before this was a park this was the site of what was called the Peach War between the Dutch and the native Lenape, specifically, the Weekwaeskeeck tribe. Having sold the immediate territory to the Dutch in 1639, they tenanted the property thereafter until a Weekwaeskeeck woman stole a peach from an orchard owned by Henrik Van Dyke, who shot the woman dead. The tribe retaliated by burning Dutch homes, and the Dutch fled to Manhattan Island. At length Jacobus Van Cortlandt, who later became NYC mayor, purchased the property in 1699 and the Native Americans dispersed west. New York City obtained the land from the Van Cortlandts in 1888 and committed much of it to parkland. The National Guard also used the field for drills, mock battles, and polo matches until World War I when the US Army temporarily took over the entire park for training exercises. The presence of the National Guard was so strong here that the statue of General Josiah Porter, long associated with the Guard, has always been located in Van Cortlandt Park. 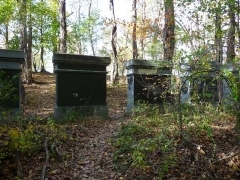 The burial vaults of the Van Cortlandts are still in the hills to the north of the parade ground. The story also goes that a bison herd was kept in the park after a stint in the Bronx Zoo while the species was almost hunted to extinction. From the staircase to the station on the east side of Broadway, a trail lined by telephone poles leads off to the east, into the park. For me, it’s always been a very special ancient pathway. There is no sign of it ever being paved, but there are signals that this was a vehicular route. Most of the poles carry masts that used to feature incandescent lamps. Others, though, carry rusty, corroded versions of Fixture 3737, as noted in the 1963 Welsbach Handbook of New York City Street and Park Lighting Equipment. I’ve always just called them the Crescent Moons. These seem to have been introduced in the late 1940s and once lit up the majority of side streets in the NYC area. They were originally used on scrolled masts attached to telephone poles, as here, but later made it onto the finned straight masts used on wood poles as well. They were not often employed on cast iron or hexagonal poles, except in park settings. The city seems to have forgotten about this batch, or doesn’t want to spend money to remove them. None of the incandescent bulbs once installed here survive. This “pathway” leads under an overpass, stamped with the date “1904.” The overpass carries a park trail that follows the roadbed of a former railroad. The Putnam Branch, or “The Old Put” as it’s called, originally ran from Sedgwick Avenue in the Bronx north to Brewster, New York on the NY Central commuter line, now called the Metro-North. It diverged from the Hudson Line just south of West Kingsbridge Road. Passenger service ended on the line in 1958, and the last fright train rumbled on the now-missing tracks in 1980. The skeletal remains of the Van Cortlandt Park station of the Putnam Branch still stand just north of the overpass. The Putnam Trail, also known as the John Muir Trail, stretches to the far north, well into Westchester County, following the trace of the former railroad. I once found an iron railroad spike (that held a wood track in place) on the trail that is still in my artifacts collection. The former tracks are still clearly in evidence on this railroad bridge spanning Van Cortlandt Lake. Time to wrap it up. 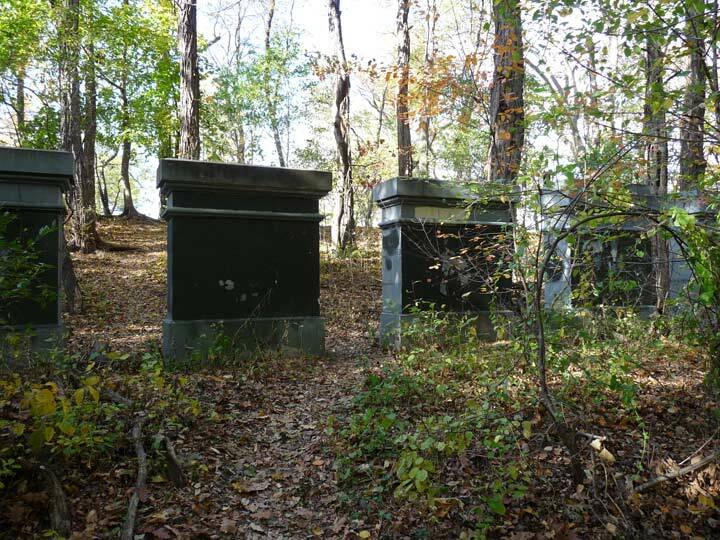 I have the story of these 13 mysterious monoliths along the Putnam Trail on this FNY page, and another “who is that guy” story in VCP here. In the 1950s & 1960s we went iceskating, I think, on Van Cortland Lake. Do they still allow iceskating there? There was a long wood building that had a snack bar and tables to warm up. There were wood park benches along the edge of the lake to put on skates and catch your breathe. Under the El station at 242nd St there was a bar that the guys from Manhattan College & the Girls from Mount Saint Vincent hung out during the 1960s. I think the name was Ernie’s and I’m wondering is it still there & by what name? As a child, I used to play in the Van Cortlandt playground at 240th street near Broadway. Does anyone know when the playground was first built and what was there before the playground?